The sighting is at least eleven years old, granted, but for some reason it feels like a tipping point. There are too many Bigfoot sightings in a certain area of SE Wisconsin to ignore. It occurred around 1999 halfway between Elkhorn and Whitewater near North Lake and only a scant twelve miles from Lima Center. A Chicago computer salesman named Joe was on his way to fish at the lake one day and was about a mile north of Millard on County Hwy. O (in map below that’s north of the bottom right intersection near small cemetery) when he noticed movement on the east side of the road through his passenger window. He slowed down and saw a seven-foot, 400-pound creature walking through the tall grass in the ditch, swinging its long arms from big shoulders and leaning slightly forward as if intent on where it was going. It was covered in “rust brown” fur that appeared uneven and unkempt, and as it turned its head to look at him, Joe said his first thought was, “Whoa, that is not a person!” His second thought was, “Don’t stop the car.” The creature’s eyes were “sunken into” the fur that covered its face, he said, and no ears or muzzle were visible. He said it reminded him of Chewbacca from Star Wars. He kept on driving and did not look back, and never told anyone about it. He is not into the supernatural at all, he said, but he came across my Beast of Bray Road site while browsing the Internet only a few days earlier and, because that was in Elkhorn too, assumed he had seen the Beast. But when I asked him to describe what he saw, his answer made it clear this was no canine. – 2005 September 16 Young man sees possible juvenile Bigfoot at Cty B & White Pigeon Road, Bloomfield Township, Walworth County. Both the Pagliaronis and the Bloomfield man passed rigorous polygraphs administered by an expert hired by the Monsterquest producers. It seems like a fairly impressive list, given the time span of about four decades and the rather small geographical area. 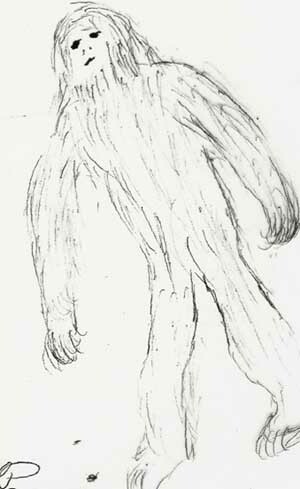 The witness descriptions all describe something 7-8 feet tall, fur-covered, man-like in shape but with longer arms, no visible ears or protruding muzzle, and totally upright. Crazed Bigfoot hunts have been conducted in other places on far less witness testimony. I think if there is a Bigfoot population here, then it must be rather small or consists of roamers from other places. It is interesting that the southern unit of the Kettle Moraine State Forest seems to be a rough dividing line between Bigfoot and Manwolf sightings, with most of the former west and south and the latter east and south. I imagine they eat nearly the same prey. I am also willing to bet that there are many more sightings I will never hear about.